“UNDERSEA VICTORY” The Influence of Submarine Operations on the War in the Pacific. By W. J. Holmes. 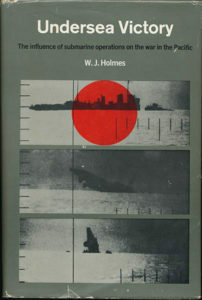 Documenting the outstanding efforts of American submarines during World War II Holmes starts his impressive book with submarine action just prior to the Japanese attack on Pearl Harbor in 1941. He then takes you through the entire U.S. submarine conflict in the Pacific, ending with the official Japanese surrender in September 1945. During World War II Homes, a former submarine officer, served on the staff of Admiral Chester Nimitz in the Combat Intelligence Unit. He also wrote the book “Double Edged Secrets.” “Undersea Victory“ is a book on the order of Clay Blair’s “Silent Victory” giving the reader a blow-by-blow of U.S. submarine action. Very difficult to find. 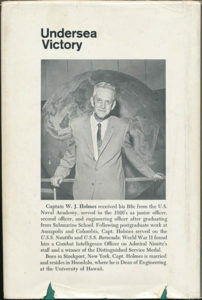 First edition (1966) Hardback with dust jacket. Note dust jacket condition in photos. A whopping 505 pages (1 3/4 inches thick), 9 maps, not including ones found inside front and back covers. Vast index and a wonderful resource book, but no photos or illustrations.